Melt all butter and 2 tbsps. evoo in a large pot over medium heat. Add onion and garlic, and saute until softened, about 5 minutes. Add the mushrooms, in two batches if necessary, and season with salt/pepper and the Porcini dust. Cook, tossing occasionally, until they have released all of their juices and most of the liquid has evaporated. Add Cognac, and cook, scraping up any browned bits from the bottom of the pan with a wooden spoon, until the liquid has evaporated, about 2 minutes. Stir in Mushroom stock, thyme and bay leaves; bring to a boil. Reduce heat, and simmer, stirring occasionally to allow flavors to blend, about 30 minutes. Remove the herbs. Pour the soup in small batches into a blender or food processor; carefully puree until smooth, and return to the pot. Stir in half and half; taste and season with salt and pepper if needed. Set a saute pan on high heat with the last tbsp. of evoo. Once almost smoking, put in the sliced mushrooms and sear on each side until golden brown. Remove from the pan and set upon paper towels. 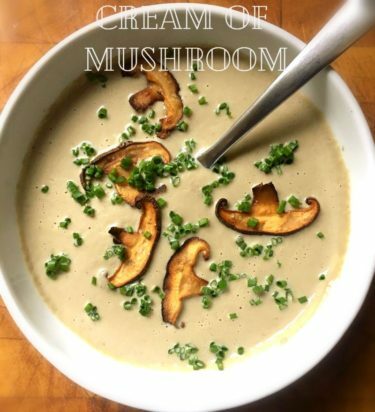 To serve, ladle the soup into a bowl and garnish with the seared mushrooms slices, fresh chives and serve immediately. Enjoy!